The disposition of the people of the United States is historically so unwarlike that to the vast majority it seems unusual for a person to seek a career in the profession of arms. This fact was recognized early in our national life and the leaders at the time saw the necessity for establishing an institution devoted to training a specified number of American youths in the art of war and instilling in them, through the United States Military and Naval Academies, the desire to serve their country as members of the military profession. Thus, the American people established the precedent of educating a selected number of young men each year for training for the service of their country as career officers into the two branches of its Armed Forces. The rapid rise to prominence of Air Power and its frightening possibilities are factors with which both civilians and the military became all-too-familiar during the recent war. Its instruments and techniques have caused the establishment of new schools for the study of their application and occasioned the organization of staff and personnel especially equipped to meet their problems. This was specifically recognized by Congress when, on September 19, 1947, it created the Air Force as a third and co-equal branch of the armed services and assigned to it the responsibility for its full share in maintaining the safety and security of the United States. The necessity for specialized studies and trained personnel in this new area of warfare was recognized during World War I, and the Military Aeronautics Department of the Army, the predecessor of the United States Air Force, during the winter of 1918 in the spring of 1919, advocated establishment of an Air Academy, ”which would bear the same relation to the Air Service that West Point does to the Army.” Further study resulted in the introduction of various bills from 1922 to 1944. Other legislation proposed in 1945 and 1946 kept the question before Congress and a matter of study and consideration before the War Department and the Air Force. The United States Air Force is now the only branch of the nation’s armed services lacking a center for the education of its future leaders in the intricacies of its own particular field. These leaders will be held strictly accountable by their countrymen in a not unforeseeable future for maintaining control of an area who’s finite limitations are defined only by the extent of the atmosphere, the mediums of transmission, and the skill of its operators. Among the serious problems facing the United States Air Force is that of establishing a system of undergraduate education which will prepare officers for careers in that service. Because the educational prerequisites for commissioning have had to be lowered to secure the necessary officers, the number of non-college compared to college graduates within the Air Force has been increasing each year. This has resulted in an increasing number of officers who do not measure up to the standards of education required for the execution of their duties at the highest peak of efficiency. The Air Force needs a system of procurement that will provide an adequate number of college educated, uniformly trained officers with the character and personal attributes desired–a system that will give stability to the officer corps and unity to the objectives and ideals of its members. The army is currently furnishing the Air Force 40% (approximately 200 per year) of the graduates at West Point and the Navy has offered 7% (approximately 45) of each graduating class from Annapolis. This maximum of 250 regular officers per year is a temporary measure and not only falls far short of meeting the needs of the Air Force but deprives the other services of their vitally needed officers, who have been educated for service with land or sea forces. The main sources of officers in the past have been the Aviation Cadet program, Air Reserve Officers Training Corps, and Officer Candidate Schools. These sources are now able to provide approximately 500 annually of the type of career officers needed by the regular Air Force of which the Air ROTC is the main source at present. This is still about 500 short of the required number, and it is this deficiency of 500 that the proposed Air Force Academy will eliminate. Numbers available from this source very in accordance with economic world conditions. In years of prosperity the enterprising college graduate who is out to make his fortune is not greatly interested in a military career. The Air Force cannot build safely and surely for the future if the regular officer procurement is based on unreliable and variable sources. West Point was founded at the insistence of Washington, Knox, Hamilton, Jefferson, and Munro. These men knew from bitter experience the need of a school for the professional training of officers–officers who could establish and maintain the standards of the Regular Army and impart the same standards to the militia and the citizenry with the latter were called to arms in times of national emergency. It can hardly be disputed that maintaining national security or, in the last extremity, the conduct of war, is such a serious business that it should be entrusted only to the most carefully trained and highly qualified men. Air Force leaders of the future should have the benefit of the best training available for practical reasons but the preservation of the lives and fortunes of the nation they ultimately rests in their hands. The Air Force, with its mission of vital importance to the nation, should be provided with an undergraduate institution which concentrates all of its efforts on producing able and properly equipped Air Force leaders. The mission of the United States Air Force Academy will be threefold: 1, to provide an assured and constant source of approximately fifty percent of the annual regular officer replacement requirements of the Air Force, 2, to provide these officer replacements with the requisite educational background essential to career service in the Air Force and, 3, to provide an adequate officer corps which may be augmented in times of war or national emergency. a. Well-grounded in Air Force principles, practices and procedures. b. Broadly and soundly educated in the humanities, sciences and military studies. c. Conscious of the mission and responsibilities of the profession of arms. d. Devoted to his career and sensible of his obligation to his country and his service. e. Motivated to work for the preservation of peace and willing to fight for its effective accomplishment. f. Instilled with a high sense of loyalty, duty and the subordination of his individual desires for the common good. g. Skilled in human relations and possessed of a knowledge of the world and its peoples. h. Respectful of the rights and liberties of individuals, institutions and nations. i. A calm, effective, resourceful leader. j. Receptive of new ideas and learning. k. A man who knows how to “win,” and how to take his place on a winning team. l. An honored representative of the Air Force. The Air Force Academy will offer a program involving inspiration, indoctrination, and instructions to develop the above attributes within the Air Cadets and provide the educational background suitable for career officers. This program will not be an end in itself but, rather, will serve as a background upon which the career officer may continue to build throughout his service for the maximum utilization of his talents and abilities within the Air Force organization. The site and constructions survey has culminated in the following recommendations. 1. The study has proven the desirability of locating the Air Force Academy convenient to an existing active air base. Therefore, we recommend that regardless of the location of the Air Force Academy, that it be located convenient to an active air base. 2. In the event the vicinity of Randolph Field, Texas, is ultimately selected for the location of the Air Force Academy, it is recommended that Scheme “D” as presented herewith, form the background for preliminary Architect Engineer studies. 3. 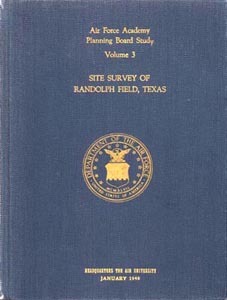 In the event the vicinity of Randolph Field, Texas, is selected, it is recommended that Randolph Field is not made part and parcel of the Air Force Academy. Randolph Field should furnish air support for Administrative flying only. In the study and preparation of the general installation plan for the proposed Air Force Academy it was apparent from the special training requirements, as well as the distinctive national character of the Academy, that some of the regulations setting space and cost limitations for standard Air Force bases could not be followed. Planning of a different order was called for. Flexibility and expandability were essential. Otherwise buildings designed to meet the needs of air officer training today could be obsolete tomorrow. In the general planning, efficiency of operation and dignity of conception were implicit; but the distinguishing features of the plan, differing from the plans of other universities or the older service academies, resulted from months of combined university and military thinking on the specific problem of how best to educate the future leaders of the Air Force. In the early stages of the project, it was recognized (since no site had been selected) that the plan could be presented most effectively as a functional diagram representing graphically the optimum relationships of the parts. The Master Plan would demonstrate principles, some of which might have to be revised when the plan was adapted to a particular site. In the matter of architectural character, although designs of exteriors have been excluded, the design of the buildings generally should be simple and fresh, and special emphasis should be placed on a few important buildings in prominent locations. All buildings in all areas are deemed to be of permanent construction and to have a consistency in design and choice of material. The shape of the Academy property, arbitrarily assumed for the purposes of the study, was a two-three rectangle proportional to the prescribed dimensions of the contract drawings. The assumed acreage of the property as established by the program was 15000 acres. Preliminary analysis of the program indicated that the property could logically be divided into five general areas designated on the general plan (attachments C) as the Cadet Area, the Housing Area, the Stadium Area, the Maneuver Area, and the Airfield Area. In discussions with representatives of the Air Force, it was decided that a road system would be needed which would make it possible to get to any of these areas without going through any other areas. A perimeter road encircling the Cadet Area, with radiating secondary roads to other areas, proved to be the simplest solution. In accordance with the above decisions, the Cadet Area was subdivided into a Cadet Housing Area, Academics Area, Athletic Facilities Area, and Drill Area with the Cadet Housing Area at the center. The Superintendent’s and Commandant’s Administrative Buildings, the Cadet Chapels, and the Cadet Recreation Center, associated but not integrated with cadet daily activities, were treated as separate entities. The Superintendent’s headquarters with adjacent Communications Building, was placed on the mall at the entrance to the Cadet Area. The Cadet Chapel was located at the end of the campus cross axis, a continuation of the axis of the Mall. The Cadet Recreation center was placed in a position convenient to visitors and cadets. The Commandant’s Headquarters was given a position on the playing fields about equidistant from the Dormitories and Recreation Center. On the campus itself, the Dining Hall was placed at one end, the Academics group at the other with the Dormitories between, flanking the main campus access in two sets of three quadrangles each, representing the proposed organizational division of the Academy into 2 wings, 6 groups, 24 squadrons. In back of the Dining Hall the playing fields and Gymnasium were placed. On either side of the Dormitories, space was left for daily drill fields. The Cadet Chapel was put between the Dormitories and Academic Building in a commanding position forming the termination of the Entrance Mall axis. Flanking the campus to the (assumed) north, the golf course was designed to separate the Cadet Area from the Housing Area while being equally accessible to both. The Cadet Recreation Center (Hostess House, Club, Theater) was located on the edge of the golf course easily accessible to visitors by car or train, and within convenient walking distance from the Cadet Dormitories. It should be noted that the requirement of placing buildings used daily by cadets within walking radius (necessary to maintain the fast-moving daily schedule) produced a concentration of buildings in the campus area. Study of the Flow Diagram for the Cadet Area, referred to in the Statement of Work, will indicate the practical considerations which determined the positioning of buildings around the campus. The only cadet buildings not subject to the general rule were certain training buildings properly located at the airfield and the Cadet Swimming Pool and Bath House, which, being intended principally for use on weekends has been set in a location remote from the “campus” area.